VolkerStevin has kicked-off a multi-million pound contract to shore up defence infrastructure along the berths of the Mare Harbour, East Falkland. 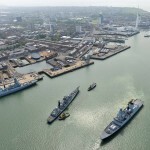 The £19M improvement programme is due to take place over the coming decade and forms part of a larger initiative commissioned by the Defence Infrastructure Organisation to modernise local military infrastructure across the Islands. For Mare Harbour this means the design and construction of new births to accommodate larger POINT Class vessels, along with “roll-on, roll-off” (RoRo) capability for the Falkland Islands Resupply Ship (FIRS). The FIRS ferries military supplies – hardware, provisions and infrastructure, together with a small amount of commercial freight – to the Islands throughout the year. The relative remoteness of East Falkland provides its own unique challenges however. Earlier this year, a chartered vessel embarked on a five-week trip from Rotterdam to the Islands – bringing with it all the necessary plant, equipment and materials – while the piles, fabricated steel pile heads and fenders were shipped directly from Shanghai. Complicating matters is the Islands’ stringent biosecurity measures, which require all items to be checked thoroughly beforehand. Piles for the main RoRo berth are being installed and grouted into drilled rock sockets at a depth of up to 20 metres. The piles themselves are 35 metres long and weigh up to 75 tonnes. To date, 14 of the 16 piles required have been installed. Once complete, VolkerStevin will fit the pile heads, walkway bridges and fenders before dismantling the marine plant, which will be loaded onto a chartered vessel and shipped back to Europe. Overall completion for this particular contract is scheduled for December 2017.